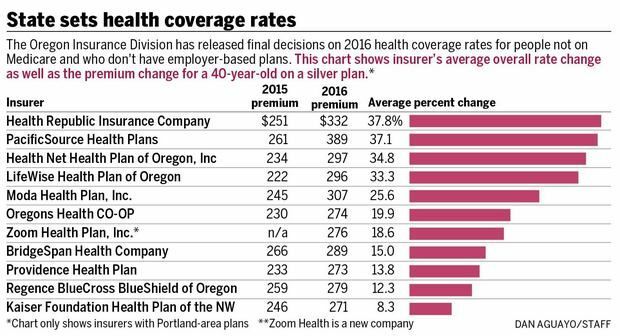 Oregon just released the 2016 premium rates that impacts over 220,000 residents that obtain their healthcare coverage through the state exchange. The cost for insurance for more than half of the health plans offered will be 20 percent and higher with the biggest increase coming in at almost 38 percent. Oregon is the first state to announce 2016 rates for people who aren’t covered by their employers or government programs. Overall, the news is not good for consumers. Some insurers had asked the state to approve rates similar to last year’s lowest. But many insurers lost money from unexpectedly high costs, so officials proposed raising many rates in preliminary decisions two weeks ago. The final decisions issued Wednesday resulted in a slightly better range of options for consumer. Still, the least expensive “silver” plan premium available to a 40-year-old next year will run $271 per month under the new rates. That’s up $49 per month over this year’s low rate. Bronze plans offer the least coverage under new federal ratings, and platinum the most. The rates were approved because, according to the state insurance commissioner, the costs of providing health services exceeded the amount of money the companies received in premiums. For example, in 2014 the cost for providing healthcare was $830 but only $703 were collected in premiums. Oregon is not the only state that will boost the cost for healthcare coverage. The numbers don’t lie – ObamaCare rates are skyrocketing. Once again the companies are needing more $ for what they do. I've seen over the last few yrs that, even though I don't like (even) the idea of 'socialized' medicine, there IS a need in this country for affordable health care. When I was young & 'bulletproof', it didn't matter...till it did. I do not like the idea of socialized medicine, BUT, it has been a godsend the last couple of yrs due to; age, allergies, cancer, etc. I do believe there needs to be something more equitable for everyone involved...it just needs some thought & work. Too many folks (esp congress) are going for the quick fix - look at obamaCare/ACA. It is a behemoth. And it, or something like it, is a necessity.